« Since April 26, 2007, the Hippocratic Vigil has been held outside the WHO headquarters in Geneva, which now makes a total of 322 weeks without interruption. The vigil consists of a silent presence that aims to remind the World Health Organization of its obligations as set out in its constitution. We have added the name of Hippocrates to our description because of the ethical rules he instituted for health practitioners. As far as the protection of the health of people affected by the consequences of the nuclear industry is concerned, the World Health Organization ignores these rules. The Vigil takes place outside the WHO headquarters in Geneva every working day from 8:00 am to 6:00 pm and in Paris every Friday from 9:00 am to 5:00 pm. We now believe it is important to address ourselves to those who are partly responsible for deciding WHO policy. 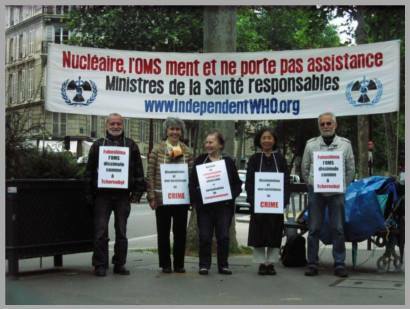 It is for this reason that, on 9th November 2012, we began a Vigil outside the Ministry of Health in Paris. The Ministers of Health are the representatives of the member countries of WHO, and they are involved in deciding the policies and actions that this institution pursues in the area of radioprotection. We will maintain this silent and peaceful vigil every Friday from 9am to 5pm outside the Ministry of Health in Paris, until France takes the necessary steps to ensure that WHO fulfils its mission to protect the population from radioactive pollution, and that a programme of independent research is put in place on a national and / or European level, on the theme of “Health and nuclear power”. This entry was posted in atomic, Chernobyl, contamination, Fukushima, IAEA, Independant WHO, nuclear power, radiation, UN human rights, WHO on July 8, 2013 by citizenperth.